Get ready, it is time for cheesy carbs and free stuff! First, the free stuff! I have been a busy girl over the last year writing and photographing my own cookbooks, and shooting the photos for other cookbooks. It has been a labor of love – and many, many cuss words. That said, I am giving away two of these books, one written by me the other photographed by me. The first is a signed copy of Moufflet, my cookbook featuring recipes for sweet and savory muffins, spreads and toppings. The second is Martha Pullen’s Southern Family Cookbook, a book that is filled with recipes and stories from Martha’s family in Alabama. I am proud of the work I did on these books and that is why I want you have a chance to win a copy of each! You can get all the details for the contest as well as enter here. Good luck! 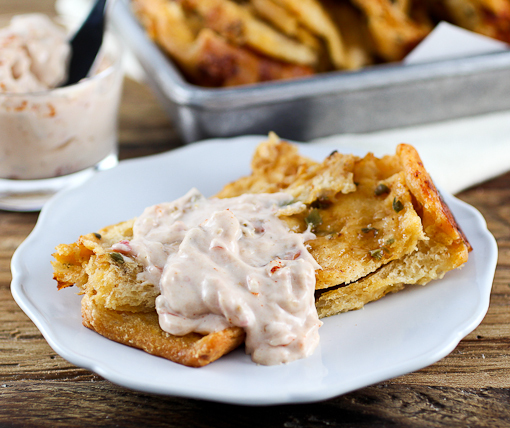 Now, let’s discuss this recipe for a moment. I have been craving bread lately. Stress is a carb trigger for me, and I care not who knows it. There is nothing that can beat the flavor of homemade bread fresh out of the oven. 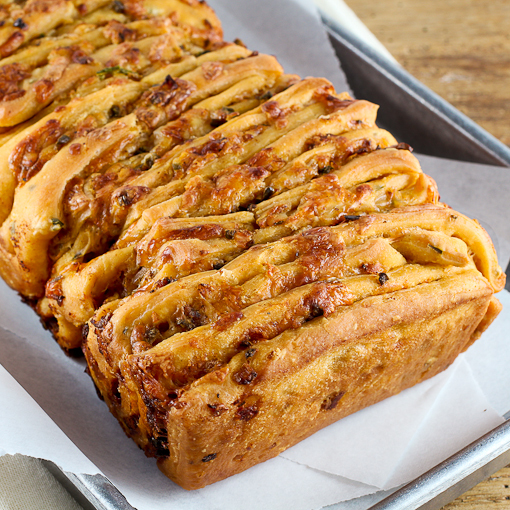 In fact, my favorite homemade bread is jalapeno cheese bread where the bread is streaked with cheddar cheese and bits of spicy jalapeno. 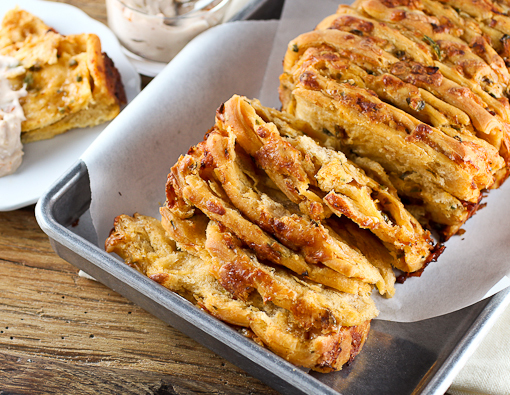 I have been kicking the idea of a pull-apart bread around for a while now, and decided to take my beloved jalapeno cheese bread and transform it. This bread combines beer, a blend of tangy white cheeses, and (probably too much) butter to make a loaf of bread that is addictive and unforgettable. This is the kind of bread you will want to share with others. It would be perfect for an informal party – perhaps for a sporting event or even the holidays – where you want your guests to dig in and get hands-on with their food. Possibly the best part of this recipe is the crispy edges, where the cheese melts against the sides of the buttered pan and becomes crispy and brown. Just thinking about it is giving me a mild case of the vapors! 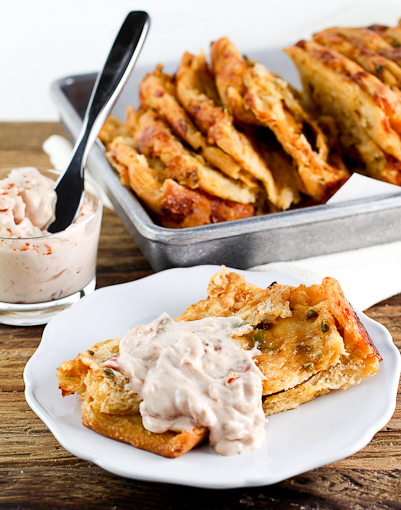 I served this bread with 8 ounces of cream cheese whipped with 1/3 cup of extra spicy salsa, which is also great on tortilla chips and can do double duty on the appetizer table. Serve this bread warm for the best results. It is much easier to pull apart warm, and the cheese gets gooey! 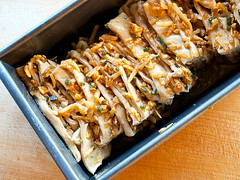 If you want to make it earlier in the day – which is fine, too – just wrap it in foil and heat it for 15 minutes at 350 F just before you plan to serve it. 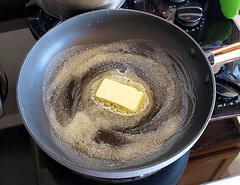 In a medium skillet over medium heat add 1 tablespoon of butter. Once the butter foams add the diced peppers and onions. Cook, stirring frequently, until the mixture begins to soften, about 1 minute. 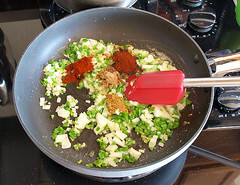 Add the chili powder, cumin, coriander, and smoked paprika and cook until the spices are very fragrant, about 1 minute. Add the garlic and cook for 30 seconds. Divide the mixture in half, placing one half in the work bowl of a stand mixer and the other half in a medium sized mixing bowl. Allow to cool to room temperature. In a small bowl combine the beer, water, and yeast. Let the mixture stand until very foamy, about 10 minutes. Pour the yeast mixture into the work bowl with the pepper mixture along with 2 tablespoons of melted butter, flour, salt, and baking powder. 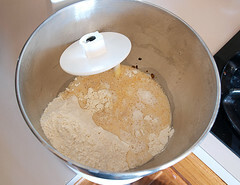 Mix with the dough hook for 3 minutes on low speed. 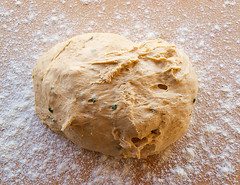 Check the hydration - the dough should form a smooth ball that is fairly sticky. Add additional flour if needed to achieve the right consistency. Increase the speed to medium and continue mixing for 5 minutes. Turn the dough out onto a lightly floured surface and shape into a smooth ball. Place the ball into a bowl that is lightly coated with non-stick cooking spray. Spray the top of the ball lightly, cover and let the dough proof until double in bulk, about 2 hours. 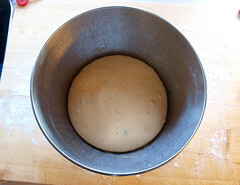 Once the dough has proofed turn it out onto a lightly floured surface. 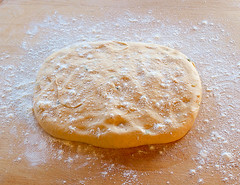 Dust the top of the dough lightly with flour, and with the palm of you hand lightly press out any large air bubble. 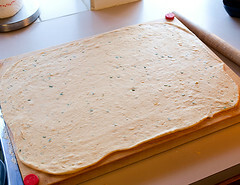 Roll the dough out into an approximately 18x12-inch rectangle. Melt the remaining butter and brush half of the melted butter on the dough. 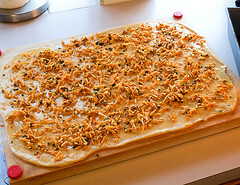 Spread over the remaining pepper mixture and both the shredded cheeses. 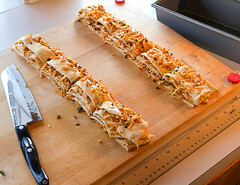 Slice the dough into 8 strips and place the strips into two stacks of four strips each. Cut each stack into 4 equal pieces. 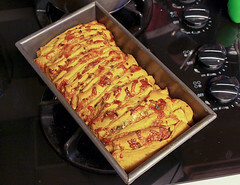 Brush the inside of a 10-inch loaf pan with the melted butter. place the stacks into the buttered pan so the cut sides face up. Pour over any remaining butter, cover, and let rise until the dough holds a finger mark when gently pressed about 1½ hours. Heat the oven to 350 F. Bake the bread for 25 - 30 minutes, or until the bread is golden brown and sounds hollow when gently thumped on the top. Allow to cool in the pan for 10 minutes before turning out onto a wire rack to cool. Serve warm. Enjoy, and don’t forget to enter that contest!